So, if you're into crafting at all, then you know that sometimes it can get out of control. You start feeling creative, and before you know it, you've made a bunch of stuff for which you have no use at all. Your next thought is probably, "who can I give this to." That, my friends, is a slippery slope. Sometimes no one wants your crafts. I'm fairly sure I know that better than most. No one wants that itchy too-white scarf I made out of the cheapest yarn at Michael's. No one wants that misshapen experiment of a tote bag I made while trying to prove to myself that I'm still good at sewing. No one wants my cheapie painted picture frame with perhaps a few seashells or rhinestones or what-have-you. No one wants...well, you get the idea. To solve this problem, today I've got a roundup of some DIY gift ideas that won't make you look like a crazy crafter. In fact, your friends just might thank you for getting creative. Of course, I relied heavily on Pinterest for all these ideas, but if you're looking for ideas, I think this is a solid bunch. So check them out below! 1. Arm Knit Blanket from Simply Maggie. This may prove an expensive gift to produce, but to really ensure your friend loves this gift, make sure it's an extra large, extra cozy blanket. It should be at least 6 feet long and at least four feet wide. No one wants a blanket that's too small. This is a particularly trendy idea right now, and I must say I love it. As a person who's lived in three different states, I think it's fun to have a little nod to your past homes in your current one. This is a great gift for your friends who are from or live out of state. For a manlier look, try kraft paper or balsa wood instead of glitter. I'm going to rate this craft idea "easy." Basically, all you need to do is find some wooden hangers and paint them the color you'd like. I always need more hangers. I'm guessing everyone else does, too. I never grew out of loving glitter nail polish, and the idea of a custom-made bottle of multi-glitter polish seems really exciting to me. Think of this: NYC brand clear nail polish is about $1 in most stores. That means, you could give each of your friends five different bottles of custom glitter polish without breaking the bank. Pretty cool, huh? I think this is a really pretty idea. You don't even have to use paper butterflies. Usually, around the Holidays, it's possible to buy actual 3-dimensional fake butterflies. They might just be a little more impactful. Think of how cool these could be with a bit of metallic or even some glitter. Cute, fun, and perhaps a great gift to tie into a larger gift's bow. The perfect gift for your favorite single girl who loves to entertain. You can get candlesticks for a dollar at the dollar tree. This is a great crafty gift on the cheap. I think these are so pretty when you put a bunch of them in your hair. These are also great hair accessories for weddings and holiday parties. If you're a spinster, you've probably got a lot of both. You can package these any way you like, but a gourmet s'more's kit is a nice way to celebrate the season and get cozy. The recipients will thank you! This is an especially good gift if you work in one of those offices where everyone feels like they should exchange gifts. Ain't nobody got time to think of something personal for every person. Voila! This is cute, personalized, and cool. Perfection! If you want to make extras, why not just do little designs instead of initials? That way, if you forget about someone, you'll have extras available, and no one will be the wiser. I hope that today's post has inspired you to get creative with your gift ideas! Tomorrow we'll be back to the shopping! These are super cool for the teen queen who likes to talk on the phone or listen to music while she's outside. Keep your ears toasty and entertained all at once! Pair this with jeans or a skirt for great outfits for the new semester. Clueless still holds up...big time. If your High School student hasn't seen it yet, the time is now. If she has, this wall calendar will be excellent. Can you believe Clueless is now sort of retro!? I would have loved this when I was a teenager. All the makeup for all the dress up. Jazz up those sneakers with a little mustache. These also come in wings. Pretty fun. Just a cute little bit of sparkle that'll go with pretty much every outfit. If your student has block scheduling or otherwise starts a new bunch of classes every second semester, a fun new binder is always a great way to feel like the semester is fresh with no mistakes in it...yet. This is an E Gift Card, but you can get them in person, too, if you live near an Urban Outfitters. It's tough for parents or non-peers to pick out clothes for teens. With this, you can print out a copy of it and let her choose what she likes! I'm not going to lie. I own some glitter mascara. I pull it out every now and then just for a little extra oomph. This one's cool, though, because it also includes liquid liner. With this gift, she can paint each one of her toes or fingers a different color. Markers are a serious high school staples. Glitter markers are kicking it up a notch! So, as you may have guessed, I've com home for Thanksgiving, and I've done al I can not to eat the delicious puppy known as Miranda. So far she is still alive, and we can all be thankful for that. She was indeed the cutest puppy everywhere we went yesterday. But how could she not be? 1. Check my Instagram throughout the day to see when I've posted a new item. 2. When one is posted, follow the visual clues in the image to see where it could be. This is even more fun i you know Sumter well. 5. Leave a comment on the photo I posted of the piece you've just gotten, saying you claimed it! 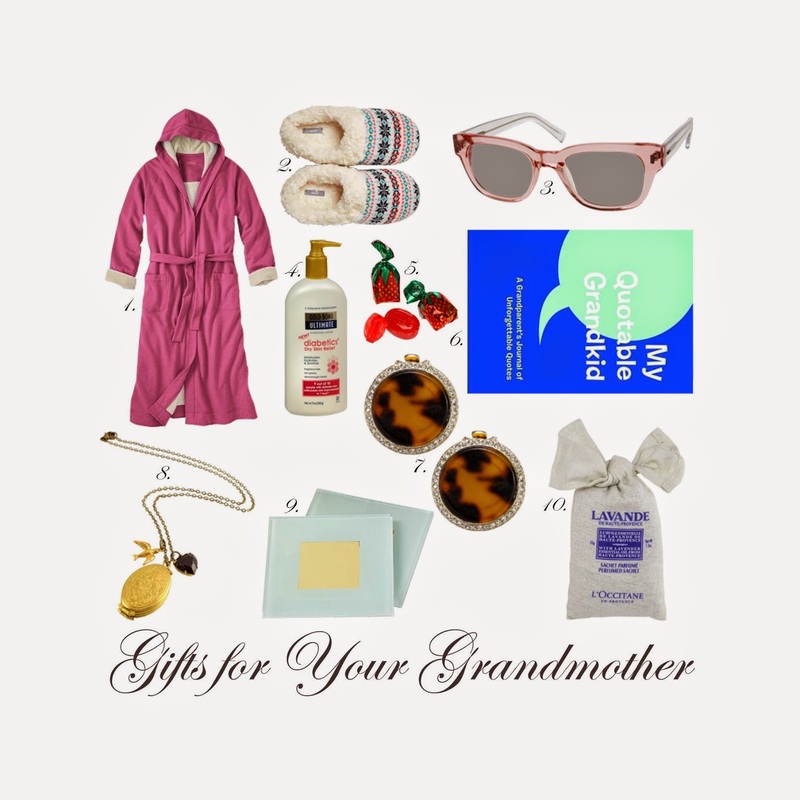 Shopping for your grandmother can be a real task. She's lived two generations longer than you have, so she's had plenty of time to accumulate lots of stuff. So what do you get a woman who probably actually has absolutely everything? I have a few suggestions. Chances are, your grandmother already has a robe. But how old is it? And is it as cozy as this one? I know, Aerie is generally for younger ladies, but I'm telling you from personal experience, these slippers are super comfy. Perfect for some granny feet. Any of the frames on Zenni Optical can be made into prescription sunglasses. Now, all you need to do is contact your grandmother's eye doctor and get her prescription. Super cute sunglasses are just a few clicks away. If your grandmother has Diabetes, perhaps she'd like some of this specialty lotion. They've certainly been talking about it on TV a lot lately. I had no idea dry skin was a big issue for diabetic people. The more you know. Because your grandmother needs to refill that cut glass candy dish sometime. I have a grandmother who would have absolutely eaten this up when I was younger. My guess is that yours would, too. Get your grandmother in on the tortoise shell trend with these easy-to-wear clip on earrings...because she doesn't have pierced ears. This is the perfect gift for a grandmother (or mother) who has lots of people to occupy her locket. Now she doesn't have to put a group shot in there! Sometimes when you have coasters printed online, you have to use the same picture on all of them. With these, though, you can just slip the photo you want in there. Voila! A little variety! Keep those matching track suits fresh with this lavender perfumed sachet! Ok, now that we've got this solved, next item to tackle is your grandfather. I'm going to need to think on this one. After yesterday's post on the Indie Craft Experience, I decided I needed to make a gift guide for the crafter on your list. 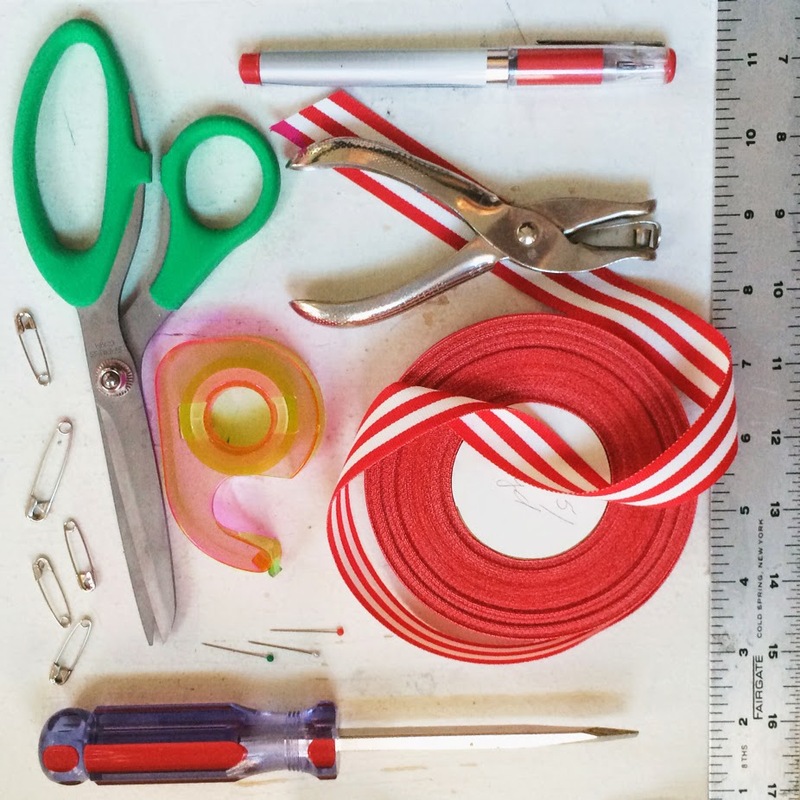 Of course there are specific supplies for specific crafts, but today's guide holds a few general items a creative person might enjoy. The items on this list range from $0.65 all the way to $165, but I think there's probably something great on this list for just about any crafter. So, let's get started! In case you don't follow me on Instagram, I figured I'd let you know about a little something I put together this year for the Holiday Season. Inside The Spinsterhood Diaries coloring book are a bunch of the illustrations from this blog, all devoid of their color and ready for your crayons, markers, or colored pencils! My friend Sara owns a copy, and I am incredibly flattered. At $5.35, I feel like this is a fun gift or stocking stuffer for anyone on your list who needs a little stress relief or just likes to color! 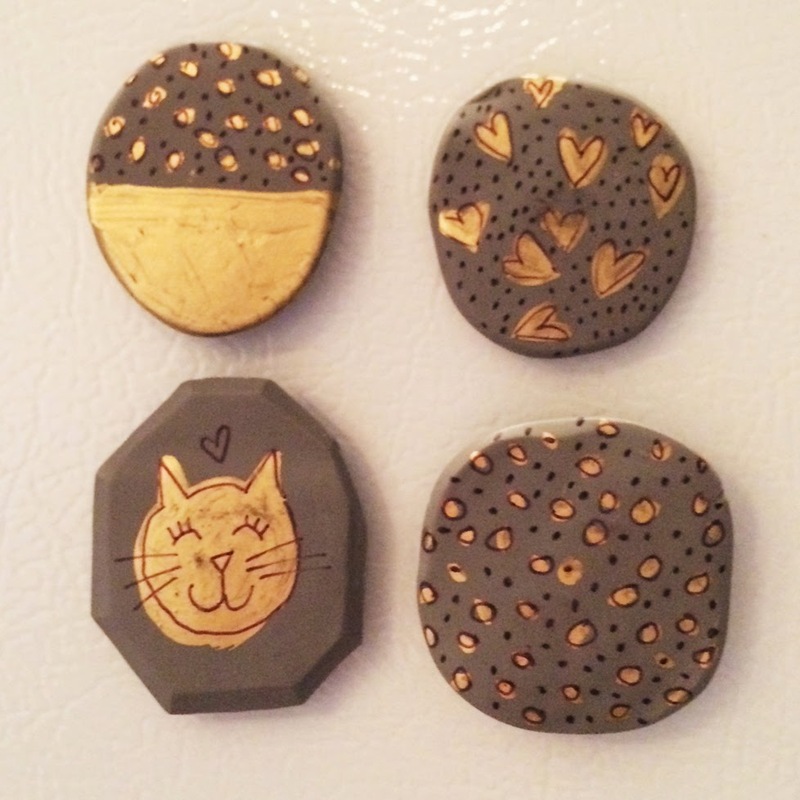 Washi tape is a fun way to add things to your sketchbook, scrapbook, wrap gifts, or decorate other crafts. With the Washi of the Month club, you get a surprise roll every month for three months. Of course I think month clubs re the gift that keeps on giving! What better way to celebrate the crafter on your list than by givigint them two years' worth of DIY ideas? I have no idea about the quality of these colored pencils, but I do love Muji. Their minimalist packaging always makes everything I purchase there seem so fresh and clean. If you've never shopped at Muji, and you appreciate good, clean design, you should take a spin around their website. It is so nice. I'm just telling you guys, 3D printing is about to be all the rage. 3D printers are already coming to the market in a price range that is affordable for some lay consumers, but I'm thinking that soon they'll be even more accessible. For the person who's not quite ready for the programming involved in a real 3D printer, there's the 3Doodler. You can just draw things in 3 Dimensional plastic. it's great for kids or just people who like to putter around with creativity. Also, think of the jewelry possibilities! If you look on Pinterest, sharpie-decorated sneakers are always a popular DIY. So, the gift of a plain white sneaker, possibly accompanied by a multi-pack of sharpies is a fun idea for your crafty fashionista. I also think this would be right up most high school crafter's alley. Anyone who likes to draw with pencils knows this is a mainstay of their collection. You can purchase a kneaded eraser at most places where erasers are sold. At $0.65, this is probably the most affordable item on any of my gift guides, and It makes a great stocking stuffer. A cool way to get the creative juices flowing on a daily basis. Great for doodlers of any age. If your favorite creative putterer doesn't already have a light box, then this is a great addition to their collection. Though tracing is sometimes frowned upon by serious illustrators and draftsmen, it can be incredibly useful for other crafts like making your own needlepoint patterns, for example. Yes, yes. It's another month club. the $165 version is actually the most expensive. For just a monthly subscription, the recipient pays $15. Not too bad, right? My poor mother bought herself a set of these when she still had three kids in the house, and we all but destroyed them. They're really good markers/pens, though. Great for gift tags and other writing/drawing projects. I particularly appreciate a brush tip. 1. 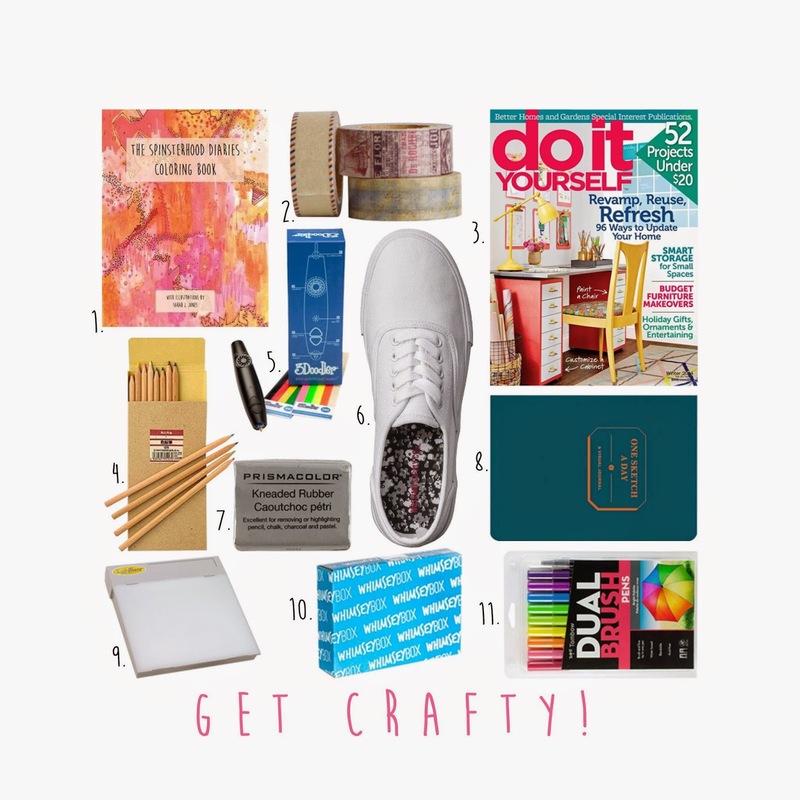 18 Awesome Gift Ideas for the Crafter, Artist or DIYer! 2. 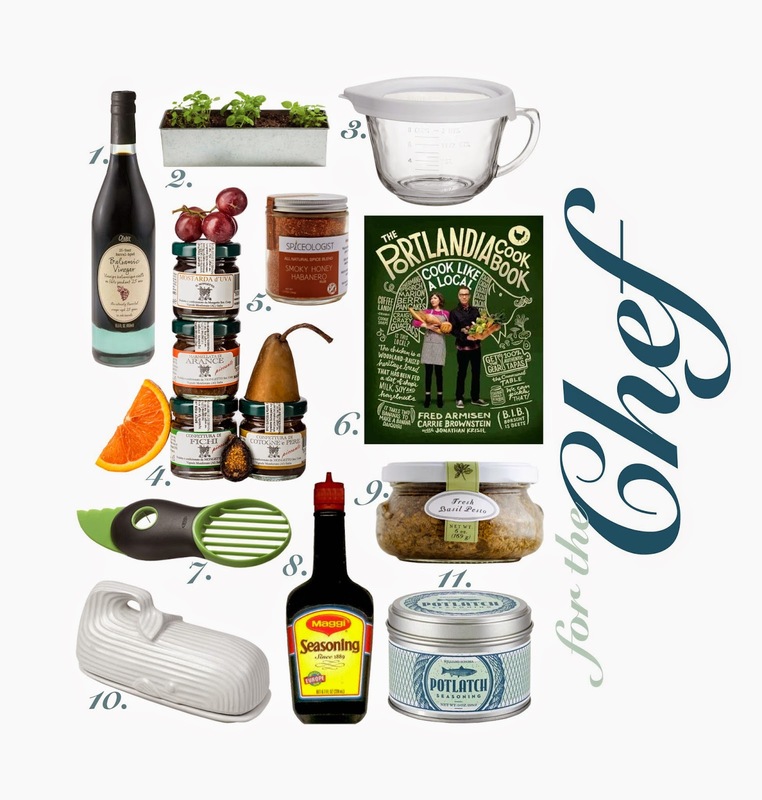 10 Great Gift Ideas for DIYers & Crafters. Happy shopping and happy making! On my way home from work last Thursday, NPR informed me that November 22 and 23, the Atlanta Freight Depot would be hosting the Indie Craft Experience. There would be booths and booths of makers selling their wares for the holiday season. I knew I needed to go. My friend Sara was game for an adventure, so we made our way downtown for some IRL shopping. The main room was much larger than I had expected, and so we girded our loins for some serious perusing. There were so many booths and vendors that we had to walk through twice to make sure we'd seen absolutely everything, taking a break for some hot apple cider and an incredible oatmeal cookie peanut butter sandwich from Jimella's Bakery. I cannot tell you how delicious that was. There were so many excellent finds at the Indie Craft Experience (or ICE) that I decided I needed to make a gift guide including items from a few of the vendors at the depot. So, below I'll post links to all the goodies in the collage, and then below, I'll show you some photos of what ICE was really like. So, check it out! Though this is called a finger puppet, the booth at ICE was really cute, displaying all of these precious animals on little wooden peg stands. This is such great gift for a baby's room. This print is both cool and informative. If you're an Atlanta native, or have lived here at any point, this is a perfect bit of art for your home. Bonus: I met the artist, and he was really nice. These necklaces are simple and fun and could spice up any outfit. The little tassel is a great detail to add some interest to the back. This whole Etsy store is actually really cute. I highly recommend heading over there and checking it out! This was one of the most professional-looking booths at ICE. My favorite item in this booth was actually a pack of neon pink pencils with gold foil hearts. Unfortunately they weren't available on the website. These Everyday Mail Flair stickers are great, though, for your friend who still loves snail mail. These brass dart studs are quirky and cool. If you're really literal, they might be perfect for an outing to a bar with billiards and dart boards. This is a really good statement necklace to throw on with a basic outfit. I love the colors, and it'd go great with a lot of different ensembles. At $15, this is a steal! The website for The Cordial Churchman actually features a photo of illustrator/designer Stephen Crotts and his wife. I loved that. Furthermore, for the right guy, a quirky/cool bow tie is the perfect gift. I always say I could drink balsamic vinegar, and at Strippaggio's table at ICE, I actually did. Here I've linked the Raspberry Balsamic Vinegar, but the White Balsimic was also excellent. These were the only two I tried, but they were magnificent and thick. I highly recommend this as a gift (to me). All of the jewelry on Lizerati is really nice and minimal. She has constellation necklaces, little triangular studs, and a bunch more lovely designs. She had a lot more inventory at ICE than she currently does on Etsy, so check back later for more items! I like how simple these earrings are. These are a safe bet for pretty much any lady with pierced ears. Cameoko also offers similar necklaces. Very nice. This is a cool gift, especially if you happen to have a Peruvian friend. If not, It's still pretty great. I think this would be the perfect piece of art for a breakfast nook or a kitchen, especially for a real coffee lover. $25 for an art print is pretty good. At that price, you can still afford to matte and frame it for gifting. 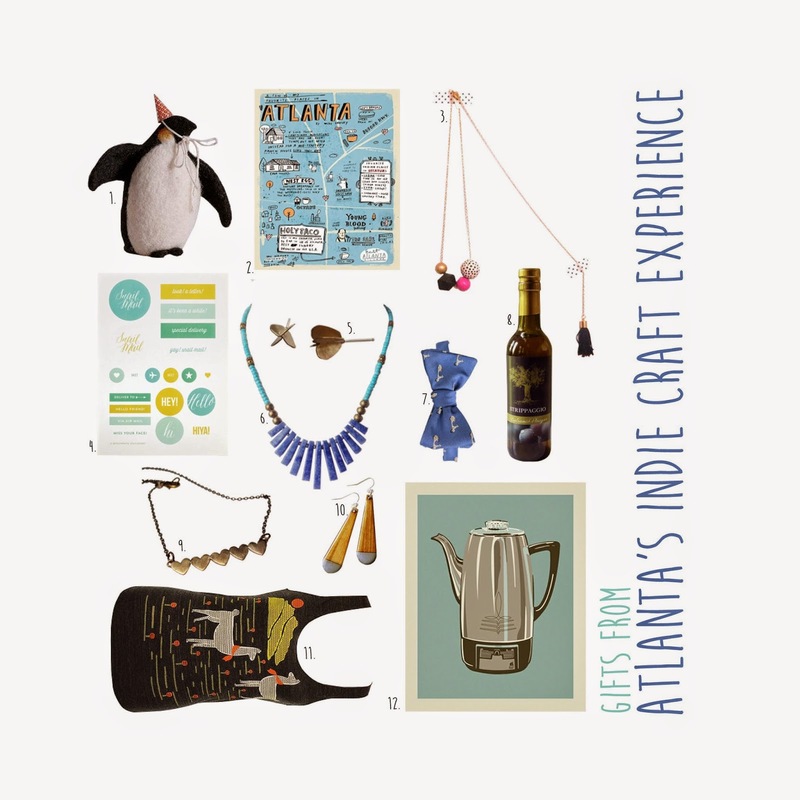 For more of the vendors from Atlanta's Indie Craft Experience, check out the vendor list here. Most of the vendors have links to their websites, so you can peruse from the comfort of your couch! The first image is from Rkitekt. I thought these necklaces were too cute to pass without taking a photo. Here's a photo of the excellent oatmeal and peanut butter cookie sandwiches at Jimella's Bakery. I really wanted to post this "Don't Call It Hotlanta" tee, but they actually don't have them available online yet. It's from You've Been Noted. This little guy is from Petit Felts. And so is this precious piglet. Lastly, we have this fabulous Balsamic Vinegar. I actually did drink it, and it was delicious. You guys. Black Friday is this week, and if you're anything like I am, once you're sufficiently turkey-logged, you won't want anything to do with shopping outside of your home. But of course that doesn't mean you have to forfeit buying excellent gifts. Of course all of my gift guides so far have included links to where you can purchase all the items, but today I want to talk about something a little different. If you've been reading this blog for long enough, you know I have a little bit of a Zazzle obsession. I love it for gifts especially because when there's someone for whom you're drawing a blank, you can always order something personalized for them. For your grandparents, there are mugs, coasters, and calendars customizable with family photos. For your parents and siblings, there are wall canvases, tees, mouse pads, and - what we're talking about today - iPhone 6 cases! One of the most exciting things about getting a new phone is buying it a new outfit....or, if you want to pretend you're more sensible than that...a new protective case. Today I've perused the many designs on Zazzle (as well as adding one of my own) to create a collage and shopping guide of some of the coolest cases for your favorite distraction. And, don't worry! If you still have an iPhone 5, many of these designs can also be ordered in that case size as well. Now, let's get to linking! This is a perfect purchase for the colder weather. It's festive and classic, but it could go preppy or punk. I love this case because it's got a cute vintage vibe while also speaking to one of the main utilities on my phone: the camera. Great for the creative girl or guy on your list! I like that this has the visual texture of watercolor and glitter while being smooth so that it doesn't scratch up anything inside your purse. This case is cute and girly with a little bit of sparkle and shine. This will go with pretty much every outfit. This floral print has a bit of whimsy, and the color palette is so nice. As a bonus, you can customize it with your name or initials! Of all the items in this list, this is probably my favorite. I love the color play and the natural textures. I'm not sure why this is called "the sound," but the image is really soothing. And this one's a little bit of shameless self promotion. This iPhone case is available on the Zazzle Spinster Store, and it's one of my favorite images from The Spinsterhood Diaries. For the iPhone lover who also has a sweet tooth! This case makes me want ice cream...or a doughnut...or maybe both. 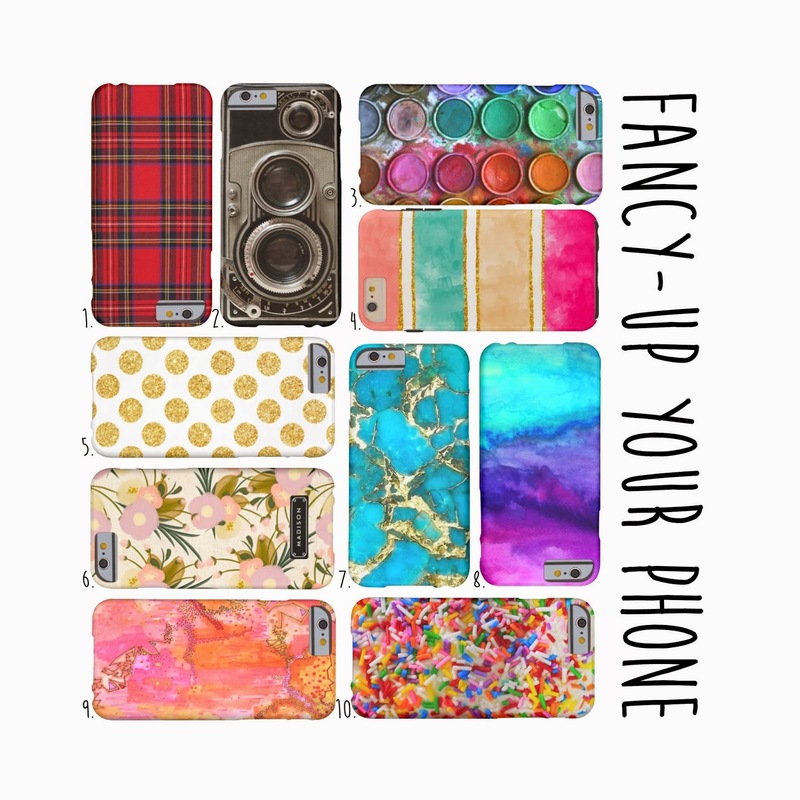 There are literally thousands of iPhone case options on Zazzle, and you can check them out here! If you don't find anything you like, or if you have something special in mind, you can always create your own by uploading an image you love. 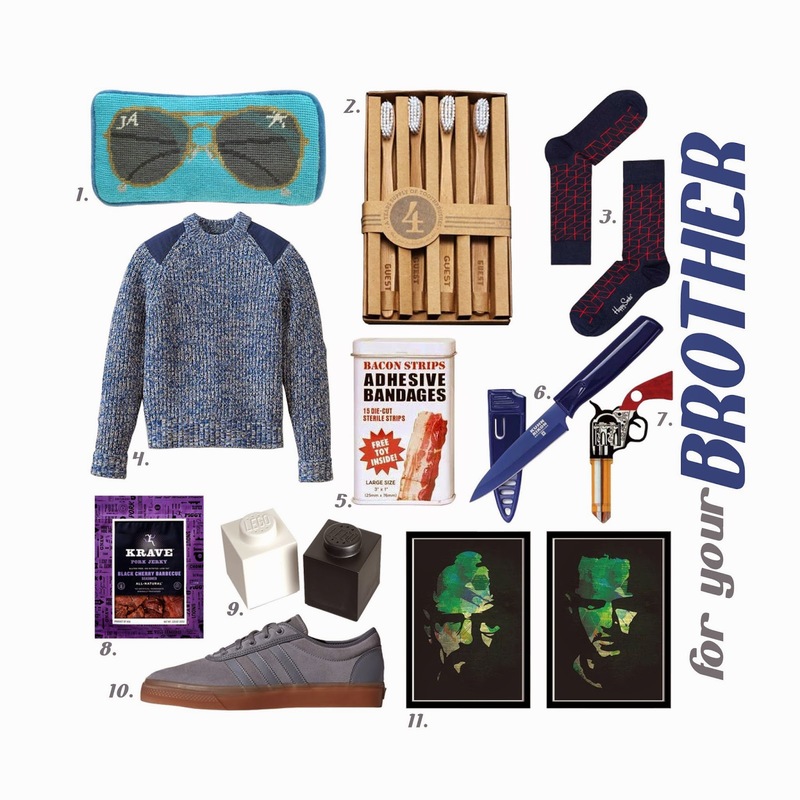 If you have a brother, then you know that unless a specific idea hit you of the perfect gift, shopping for him can be a bit difficult. What does he want? what does he need? Well, friends, I would like to say that your guess is as good as mine. I have, however, been doing quite a bit of research, and I think I've found some good options for your consideration. Above you'll see just a little bit of everything, and below you'll see the links. So let's get shopping! I love a Jonathan Adler needlepoint. This is super cute for the brother who likes his shades. For the brother who's always having guests. Someone always forgets their toothbrush. Fun socks you could still wear under a navy suit. This is a cool way to stay warm. It's got some fabric blocking at the shoulder as well as elbow patches. Cozy and cute. Maybe next time your brother cuts himself shaving, he can just cover it up with a little bacon. This is great because it comes with a sheath. So, if your brother is an avid camper or tailgater, this is a great thing to bring along. I love the idea of a novelty house key. Or even a spare key. All you have to do when someone else is opening the door is say "oh, yeah...it's the gun key." What's cooler than some gourmet Jerky? This Black Cherry and Pork BBQ flavored jerky sounds like a brother's dream. Bring some nostalgia into your gifting with these lego salt and pepper shakers. For the brother who's a little hip but wants to stay comfy. I really like these sneakers. If your brother is still lamenting the ending of Breaking Bad, perhaps this is a way to put salve on that wound. Now we're going into Thanksgiving week, and the heat is on! less than a week until Black Friday! It's tough to shop for dads. The usually don't really need anything. That doesn't mean we don't want to give them gifts, though. My strategy is usually to go with something completely novel and unnecessary. I feel like it usually works. Today I've put together a gift guide with some items that are useful and some that really aren't but are fun nonetheless. Hopefully you can find something on this list that you think will fit your father's interests and likes. So let's shop! This is just bizarre. But how fun is it? Very. This Sodas like peanut butter and jelly and sweet corn also exist. It's just something fun to try. A nice, luxurious scarf that'll go with everything and make your dad look quite dapper. This, I think, would be a real win, especially if your dad's really into steaks. I would like the women's version of this, please. Wrinkle free? Yes. For the dad who always likes to take a family photo on the holidays. Now he can just use his iPhone! Your dad will never be caught off his guard by a fix-it emergency with this slim tool set. I put this on the list because my dad loves circus peanuts. Discussing this with a friend the other day, I discovered her dad also loves them. So, maybe it's a dad thing? Fur lines moccasins are perfect for when your dad's enjoying a little leisure time. These have rubber soles, so he can even wear them outside. A novel way for your dad to keep the key to his tool shed...or car...or anything. It even has a little light so he can find the lock. This mug is heat sensitive, and when it's filled with coffee it smiles! My dad doesn't drink coffee anymore, but when he was drinking it, I think he would have agreed with this mug's feelings. Now, go forth and get some holiday shopping done! So, I've already done a gift guide for regular moms, but moms with young kids are a whole different story. They're busy, and they're stressed, and of course, they need gifts, too! Just because moms with kids are running around after their children doesn't mean they can't have cute shoes. These fancy sneakers are perfect for making a cohesive outfit and keeping a toddler from putting everything in their mouth. Load this locket with photos of the kids, engrave it, and wrap it pretty. Voila! A thoughtful mommy gift. Sometimes, when you just want to wear a tee shirt and stretchy pants, if you throw a scarf on top, it looks like a complete outfit. Easy peasy! Just because your kids get themselves into a lot of scrapes doesn't mean they have to wear boring bandages. Enter these cool J.Crew band aids. Give this recipient some mommy me-time with a makeup update. Spear offers gift cards, and they carry lots of different kinds of products. However, if the mommy on your gift list is partial to a certain brand of cosmetics, consider purchasing a gift card for that brand and then setting up an appointment to have her makeup done. It's so relaxing, and everyone loves a little makeup update. Aspirin plus caffein? I think this is everything a young mom needs. These are great for a mom with young kids because they pretty much go with any outfit. Moms can keep these in their purse, or just in a dish by the door. Quick and easy. How fun would it be to come home to a peacock lollipop display!? This is also great for parties, doctors' offices, and front desks in general. Wiping runny noses and tying shoelaces can be tough wearing mittens or regular gloves. These hybrid fingerless gloves/mittens offer warmth and dexterity. Fashion sweatshirts are pretty much the answer to all life's problems. They're comfy, cozy, and cute. Wear with yoga pants, jeans, or a cute skirt, and you've got yourself an outfit. I hope this little shopping list helped out some dads of young kids. Happy Shopping! I know, I know. I do way more women's gift guides than ones for guys. But what did you expect? I'm a spinster! I'm not always hanging out with guys. Today, though, I have some ideas for your college guy. Whether he's your boyfriend, your brother, your son, your nephew, your grandson, or just your friend, I think you'll be able to find something on this list that he'd like....or at least that he'd find useful. Of course, some items (re: #s 1, 6, and 9) may depend on his personal style, but I've tried to include some things that are less a matter of taste and more a matter of use. So let's get to it! College students walk a lot, so they need some comfy shoes. Running shoes, though, don't always go with everything. Enter these stylish, casual slip ons. They're perfect for the person who is so late for class they don't even have time to tie their shoes. I'm sure you can get this at WalMart, Target, or any old drugstore, but it looks like a pretty cool razor. In fact, I wouldn't mind having one myself. It's got five blades and pulsing for comfort. Very nice. This sweatshirt is made in America, and according to Slate.com, this may be the greatest sweatshirt ever made. That's quite an endorsement. Whether you choose this specific hoodie or another one, every college guy needs a good hooded sweatshirt. It's pretty much mandatory. This is pretty cool for the college student who likes to lounge outdoors or just needs to catch a nap on the go. The hammock comes with a convenient carrying case perfect for naps between classes. Nothing fuels paper-writing like a delivery pizza. If Marco's isn't your thing, check to see if there's a local pizza joint your student likes better! You just can't get better than a free pizza. 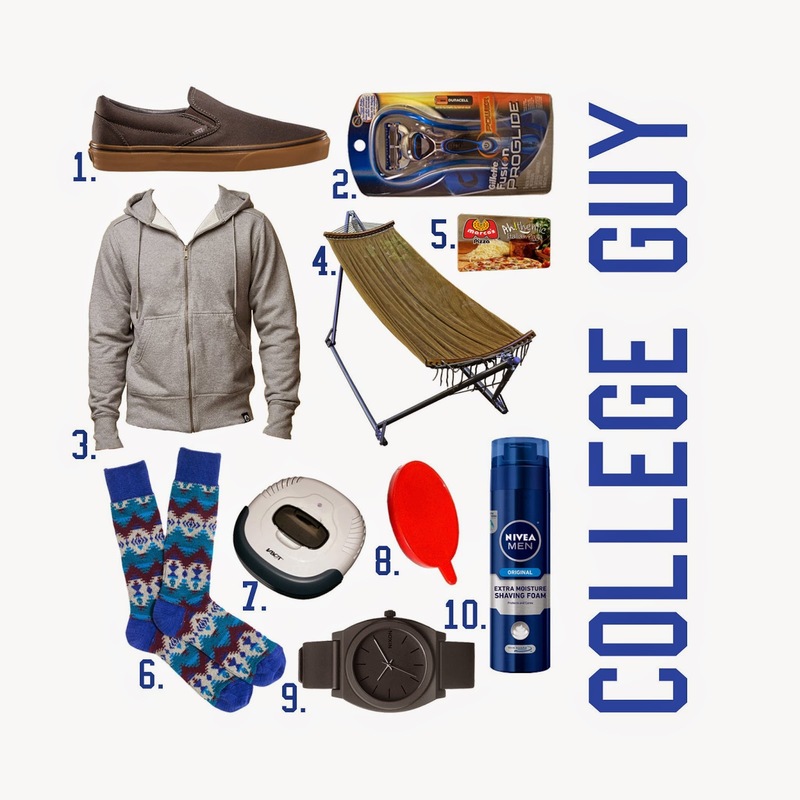 I'm sure you're figuring out by now that most of these gift guides will include a pair of socks. It's cold out, so I'm just thinking about socks more and more. And also I love them. These are cute, and they're great for a college boy who likes to be both cozy and snazzy. I'll admit I have no real knowledge of this particular robotic vacuum, but the idea of a robotic vacuum strikes me as perfect for the student who doesn't have time/energy/desire to vacuum their place. Roombas can run over $700, so I thought this was a much more cost-effective option. Bonus: Cats like to ride on these. Sometimes you don't want to drink an entire can of coke. Sometimes you are making, say, a coke float, and you only need a half a can. That's no reason to waste the rest. Slap a lid on that thing, and put it back in the fridge! In this day of iPhones and smart watches, real watches are more akin to just jewelry for men. While I really like the all black version of this watch, it also comes in a bunch of different colorways, all of which are excellent. Standing outdoors at all those football games can leave a student's face dry and/or chapped. Adding a little extra moisture to the face during a shave is just what the doctor ordered. So, now, go forth and shop! We're getting close to Thanksgiving, and won't you feel so much better if you're finished with all your shopping before Black Friday? Mothers are the best, and they really bring the holidays together. That's why it's really important to make sure your mom's gift is something great, thoughtful, and very special. Don't always give her cooking stuff...unless she's really into cooking...or unless she specifically asked for it. Give her something fun and/or frivolous. Something totally unnecessary yet completely lovely. Today I've tried to put together a list of things that would fit into the category of "just because." They're not particularly useful. They're just some nice little bits and pieces your mom might enjoy. Mom, if you're reading this, don't worry. I'll make your gift a surprise. These particular earrings may not be your mom's style, but I remember one year my mom asked for some inexpensive fashion jewelry, just so she could have a little update to her accessories collection. I think we often assume that moms only want fine jewelry, which can of course be a bit pricey. 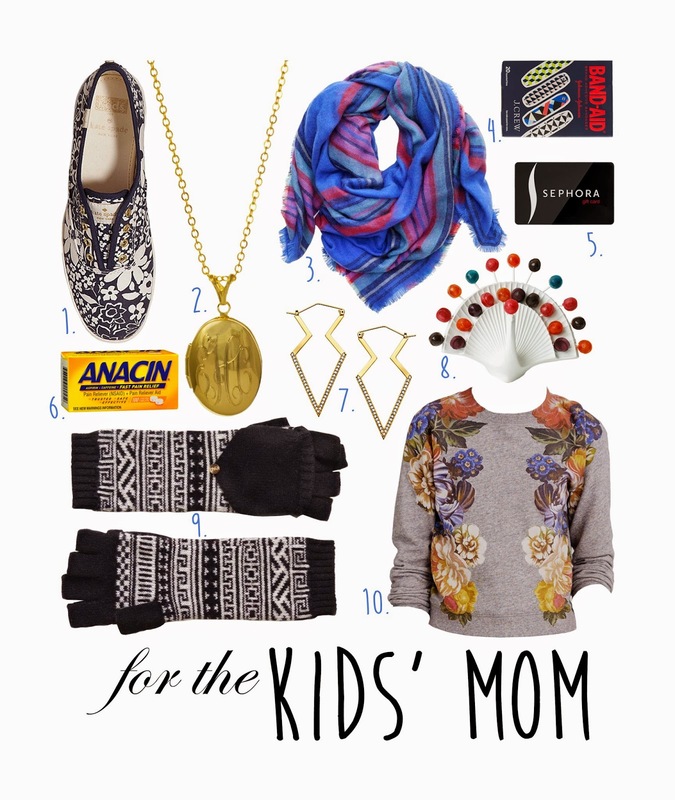 A little trendy sparkle and shine may be just what the doctor ordered to spice up your mom's wardrobe! I just love the idea of a brand new bar of soap every month. Even though I suppose that soap, by nature, is clean, the thought of a fresh bar is so appealing. This is especially great if there are guest bathrooms in your house. Your mom can relax in style in these classic, luxurious pajamas. You can even have them monogrammed with her initials! Oh la la! This definitely falls into the "unnecessary" category, but it's so pretty! And, how much more sophisticated would ranch dressing or ketchup or mustard seem if you were dipping it out of these delightful little bowls? Lavender is a lovely, relaxing scent, and if there's anyone who needs to relax, it's your mom. If this scrub (or price tag) doesn't strike your fancy, though, there are plenty of DIY Body Scrub Recipes on Pinterest. Perhaps she'd like something a little more home made? Fancy-up your mom's card group with a pack of these glamorous cards from Anthropologie. They come in gold and rose gold, and they are simply fabulous! My sister subscribes to the idea that a magazine subscription is the gift that keeps on giving, and I happen to agree. Real Simple magazine is just one of myriad choices out there for the taking. With this particular deal, though, you can get one subscription of you, and one for your mom. Not bad, eh? Natori makes some fine and fabulous robes. This one, though, seems particularly wonderful for the Holiday season. It's soft and lined in Sherpa for some extra-cozy coffee and newspaper time. Does your mother always encourage you to use a coaster? Why not get her some really lovely ones? These Celestial Coasters come in a bunch of different colors, so think about what color would go best with her living room, and voila! You've got a pretty gift. Check back tomorrow for more holiday gift ideas! 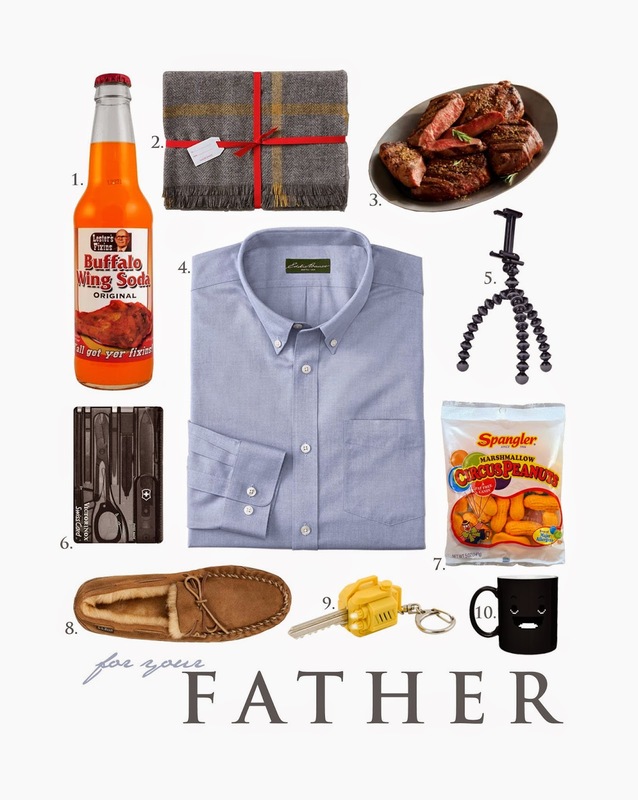 I always start men's gift guides by saying that buying gifts for men is always the hardest. So far, we've covered the Camo Man and the Tech Genius. Today, we'll tackle the high school male, or as we've named him for this post, the "High School Hunk." Of course all high school students are not the same, but hopefully there's something on this list that will suit the fancy of the guy on your list. Some of these items require a little explanation, so just check out the text under the link for a little more info! As always, for a bigger and better view, just click on the image above and open in a new tab! Even if your Teen isn't a sports fan, this is a must-have for pretty much anyone. You never know when you're going to need an extra chair, so I like to keep one in my car. This model is especially spectacular because not only does it have two cup holder, but it also has pockets on the sides and an optional shade. What more could you want? I can't help it. I'm a sucker for socks, and they're always a great stocking stuffer. You can just roll them up, tie them with a bow, and stuff them on in that stocking. Gap always has cute boxers, and so does j.Crew. 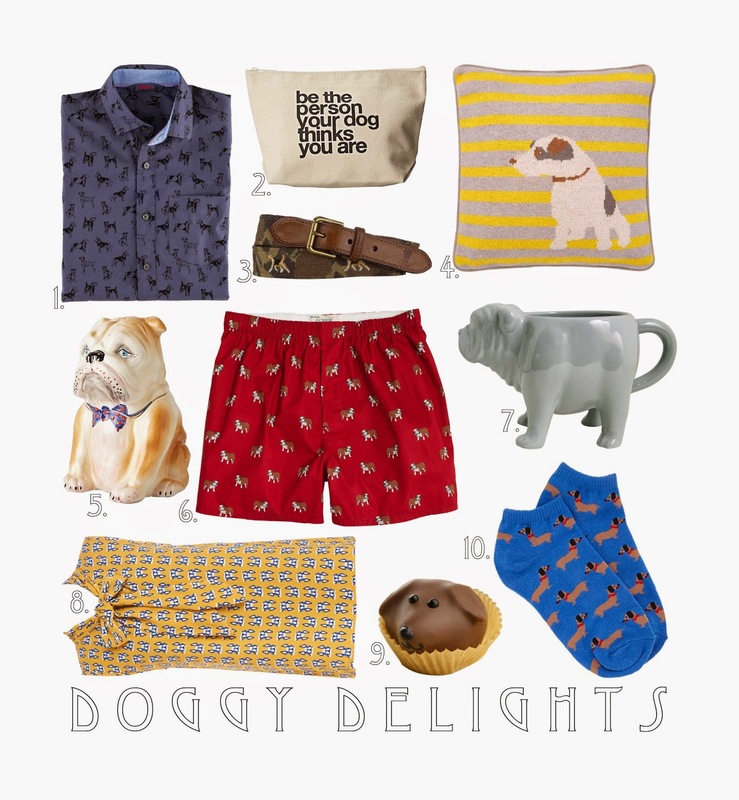 That's not to say, though, that these are the only boxers you can choose. I just feel like you can never have too many underwear or socks. There are so many ways this gift could go. I chose a Duke one to show that it could feature your teen's favorite team. However, The website, Photo Darts, allows you to upload any sort of photo you'd like. Think of it! (Hint: this is also a great gift for your friends who have recently been made single). I'm too behind the times to be using Spotify, but I hear that's what the kids are doing these days. All except Taylor Swift, that is. If your High School student isn't a Spotify fan, then maybe an iTunes Gift Card is a better choice. You were a teenager once, right? Then you know how much teens value their privacy. What better way to respect that then adding a little doorbell outside their bedroom door? It's Genius! You may think that $40 is a bit pricey for a plastic camera, but just think - current high school students actually grew up with digital photography. I own one of these cameras, and I think it's a lot of fun. The camera has eight lenses that, when you push the button to take a photo, take eight separate photos in succession. When the film is developed, each print actually has eight frames in it. I used to like to send them as postcards when I was at FIT. Just think what kind of creative things your high school student could do with this! The Mountain is home to all kinds of crazy shirts, from Unicorns to Peanut Butter and Jelly Sandwiches to Bulldogs wearing leather jackets. You've seen these guys around. What you might not know, though, is that they're 100% organic, and the more you wash them, the softer they get. I own more of these tees than I care to admit, including a kitten one, one with a unicorn, one with dolphins, and an undisclosed number of others. Explore this website. It's well worth your time. Is your kid that guy who was always drumming on his desk in high school? Or is he, perhaps, a drummer in a (or the) band? If so, these are perfect for him and also for annoying his teachers. I assume you can get this at most drugstores as well as on the Neutrogena website. According to the info on the link above, this shave gel is oil free, dye free, and for sensitive skin. If your High School Hunk is already shaving, chances are, he needs something for sensitive skin. Because Acne is the worst. I should know; I still have it. Check back tomorrow for more holiday gifting ideas!